I have found quite a good mix of books to be released in the summer month of August; some great gems for every one to read. WOLVEN is a fantasy firmly rooted in the mysterious present. A boy and his eccentric grandparents live near a strange wood - apparently cursed. He longs for a dog - but the dirty ungainly farm creature finally found by his grandfather hardly fits his image of the perfect pet. And it howls in the night. But it's only when his dog starts to grow human ears that he realises that something is seriously wrong. The truth is stranger than his wildest dreams -the boy who appears, alarmingly unpredictably, is a kind of special werewolf in reverse. A noble, almost heraldic breed of WOLVEN - the kings own werewolves from ancient times, who have been in hiding until rediscovered by evil government scientists who are trying to breed werewolves as weapons. Mexico, 1924. At his father's hacienda, restlessly waiting for adventurer Ethan to arrive, sixteen-year-old Alec and his faithful valet Coates head out into the wilderness in search of an ancient archaeological site...only to discover that Mexico is every bit as perilous as The Valley of the Kings. Pursued by ruthless bandits, involved in a plane crash in the middle of remote rain-forest and finally an unwelcome guest in a lost Aztec city where the inhabitants still practice rituals of human sacrifice, once again Alec must use all of his skills and stamina to survive. reydis has been left for dead following a raid by pirates on her father's Viking stronghold. Her brother has been kidnapped-and Freydis's father is hell-bent on revenge. But this is a volatile man who loathes his daughter and is driven by love of his son. Reluctantly he takes Freydis with him on his journey, giving her a slave-Enno-to tend her. As Freydis's father becomes more bitter and cruel, and the hunt for his son becomes increasingly desperate, Freydis and Enno draw closer together. But when battle looms on the horizon, the bonds of friendship, obedience and loyalty are tested to the limit. 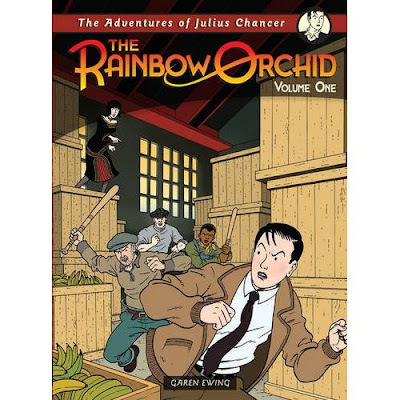 The Rainbow Orchid" is an ambitious blend of classic storytelling and cinematic artwork in which adventure, historical drama and legend are seamlessly intertwined. In Volume One, follow the story's hero, Julius Chancer, as he embarks on a hazardous quest for the rainbow orchid - a mythical flower last mentioned by the ancient Greek philosopher, Theophrastus, and steeped in legend. His epic journey takes him from 1920s Britain to the Indian subcontinent and its mysterious lost valleys. Hope you found something to look forward to reading. We're always looking out for new books, so if you have a book you would like to see on this blog, drop us an email. The hardback post is soon to follow. I really enjoyed that post. I did read it last week and found it very good. I am also a fan of your work too! I have put a link up to the site for you. So more people can read and spread the word about the Rainbow Orchid as I would love to see it do well!